GoGreen 2013 Event's sweet memory page.. - GGI-Group size: 4000+ Professionals, Increasing on day to day basis, Come & join us 2 serve Mother Nature. 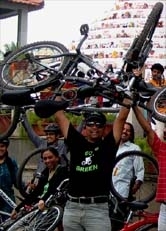 GoGreen 2013 Event's sweet memory page..
What a wonderful ride .. Blessed with cloudy weather. The ride started from Bangalore Press Cl ub, Totally 63 Cyclist participated in Bangalore Critical Mass which was scheduled on Sunday for the first time in history. Among this the youngest participant was 80 years by name “Janardhan Sir” and the eldest person was 6years old by name “Pavan” who joined us along with his parents cycled all along with us with a single speed geared cycle. Though initially we were stopped by 2 police man but while they reported about us to their Seniors who gave us a green flag.. started by 7:50am peddled through the following route. Click here for more snaps from the ride..
32 GGI participated for our 17Feb2013 GoGreen Endurance ride which includes 5 Girls, Started off from Mandovi Motors, JP Nagar 3rd Phase @ 6:15am, Our first pit stop was at Bannerghatta Circle which we reached by 6:45am, We started from their towards our 2nd pit stop which was Jagini which we were Able to reach by 7:15am 3rd pit stop @ Anekal cross by 7:25am their after we stopped in between where we were supposed to take a deviation from the main road, finally We reached Navadarashanam by 9:15am. Hot & yummy Organic food breakfast + Sweet payasam was served along with Herbal tea.. We went out for a stroll around the place for 30 minutes and came back. Many of them purchased Some organic food @ their stores. We collected min Rs.100/each as a part of donation and given to the concern person. Since the sun was coming up hence we decided to start back to B’lore.. After a Group Snap we all started off @ 10:40am. 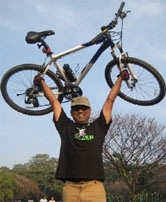 Click here for more snaps from the ride..
03Feb13, GoGreen Campaign Ride towards CV Raman Nagar. 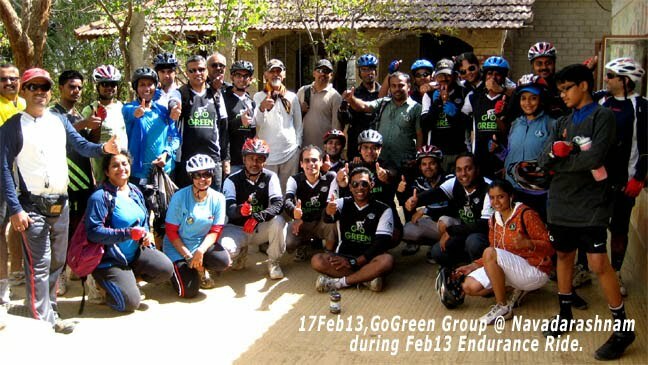 26 GGI's participated on our 03feb13 GoGreen Campaign ride towards CV Raman Nagar. As usual the ride started @ 6:45am from RIS junction bangalore south reached central meeting point cubbon park Central library by 7:30am from their we took MG Road - Trinity Circle - Old Airport road - Cambridge Road - Indranagar - Old madras Road - CV Raman Nagar. We reached DRDO township by 8:30am where we were stopped by the guards. They said we were not allowed inside as its a restricted area but we are seeing lots of public transports like Auto,Cars and other vehicles moving in and out without any notification hence we started cycling into DRDO without arguing much with the guard.. We went along the quarters and came out on Old madras road.. from their we went New Krishna sagar hotel and had our breakfast.. It was around 9:15am that we all started back.. took Koramangala inner ringroad and reached home by 10:15am.. Click here for more snaps from the ride..
26Jan13, GoGreen Republic day Ride along with B'lore's Critical March. GoGreen Republic day ride that started from RIS Junction B'lore south by 7-15am reached cubbon park central library by 7:45am their after the whole gang cycled to press club where they joined other group members to start up Bangalore's Jan-2013 Critical mass. 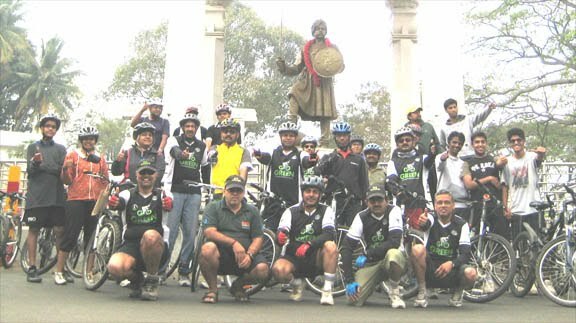 around 100+ Cyclist participated. Started @ 8:30am from press club and rode through Golf course road Windson manor under passage - Makeri Circle - Jaymahal main Road - Contronment - Queens road - High Court - Press Club and dispersed by 9:30am.. Click here for more snaps from the ride..
20Jan13, GoGreen Endurance Ride towards Hessarghatta's green lands. 26 GoGreen members started from RIS Junction by 6:00am and reached Cubbon Park Central library by 6:30am. from their we started towards Hesser ghatta as planned. We took Golf course road and passed through the windson manor under passage then towards Sanky tank then SadashivNagar Police Station - New BEL Rd - MS Rammaya Colleage & Hospital- Mathiekera - BEL Circle - Vidayaranapuram - Bylekere Peacock reserve - Hesserghatta Lake - Hesserghatta's Indian institute of Horticulture science - Nityagram road -TAJ Kutueeram. We reached our destination by 8:45am. We had our breakfast @ near by main road then started back .... Click here for more snaps from the ride..
13Jan13, GoGreen Campaign Ride towards Vijayanagar. 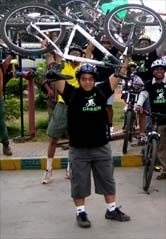 25 GoGreen members participated in our GoGreen Campaign Ride towards Vijayanagar. We all started from RIS Junction by 6:45am and took the 100 ft Ring road and passed throuh DevaGouda petrol bunk, Kadhranahalli through Hosakerehalli road we reached Mysore main road then took left and entered Chord road towards Vijayanagar. Maruthi Mandir was the destination which we reached by 7:45am.. Much before we reached this place 2 cyclist backed out due to various problems in their cycles.. We had our breakfast @ vijayanagar's Sagar Fast food which is near to BTS Busstand then dispersed.. Click here for more snaps from the ride..
Around 15 GGI's kick started GoGreen Campaign Ride from RIS Junction @ 6:45am and reached Cubbon park Central library by 7:30am. 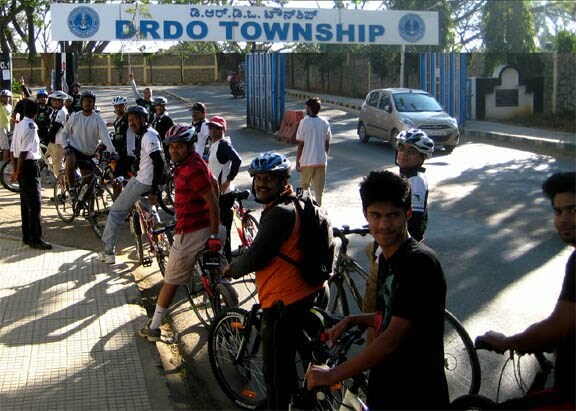 We decided to ride towards Bangalore's one of the ancient & Historical NorthEast KempeGowda's tower. We took Golf course road and passed through the windson manor under passage then to the destination. It was almost 8:10am while we reached this place which was before 500 mtrs of Makeri Circle. after taking couple of snap we took CV Raman road and reached Malleshwaram's Veena Stores by 8:45am where we had breakfast and dispersed Click here for more pics..
Kempegowda II is considered as the "founder' of bengaluru, during his time he had four towers constructed, located in four corners of the place, and expected the city to grow to those limits. The towers created around 1520-1570 are now part of Bengaluru and the city has grown enormously around these towers. The NorthEast tower is located near Mekhari circle and a beautiful park by name Ramana Maharshi has been created surrendering the tower. Click here for more snaps from the ride..